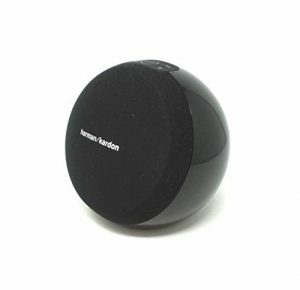 Harman Kardon Onyx Studio 4 is one of the best sounding Bluetooth speakers under $150 on the market. 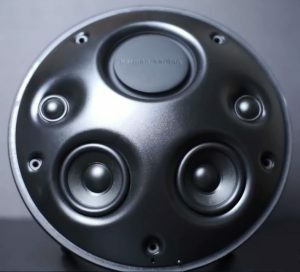 There’s a bunch of reasons to buy Onyx Studio 4 – rich, powerful, and balanced sound, amazing design (one of the most elegant speakers on the market), Bluetooth connectivity, great connection quality, multi-host (connect up to 2 phones simultaneously) and daisy chaining features (connect up to 100 speakers together), built-in battery, built-in microphone, HK Connect app. Unfortunately, it’s not all that great. Most of our complaints are related to battery durability (this beautiful speaker needs some stronger battery) and build quality. This speaker is made of premium materials and looks/feels expensive but it’s not rugged enough and it’s not the best choice if you need an outdoor Bluetooth speaker. You can use it outdoors since it’s portable/battery-operated but it’s not rugged enough. If you need something rugged and waterproof, you should look elsewhere. If you are looking for the most elegant and best sounding portable Bluetooth speaker under $150, you won’t find a better choice than Onyx Studio 4. 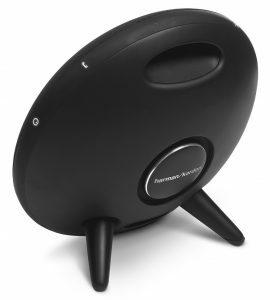 Harman Kardon Onyx Studio 4 comes in a premium-looking box along with a charging adapter (2 wall adapters for EU and US market), user manual, and 1-year warranty. Hard carrying case is not included and you have to buy it separately. The speaker has one 3.5mm input but the audio cable is also not included. 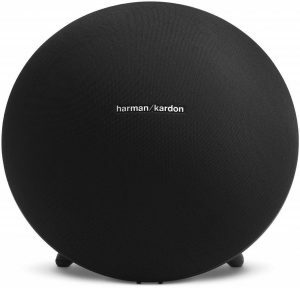 Harman Kardon has truly perfected the designing process. All the Bluetooth speakers made by this famous manufacturer look incredibly elegant and Onyx Studio 4 is the perfect example. This speaker comes in three colors (black, blue, and white) and we couldn’t decide which one is the most beautiful. They all look very attractive. The whole front panel is covered with a fabric grille that protects the drivers. There’s a simple harman/kardon logo on the grille. The grille is removable (but it doesn’t come off easily). You can use the speaker with or without the grille, depending on your taste. The grille has a protective purpose so you might want to leave it on, especially if you are going to use the speaker outdoors. On the rear panel, you will see the carrying handle at the top, the bass reflex port in the middle, and input ports at the bottom. There are also two undetachable feet that provide stability. Studio 4 features 3 input ports – micro USB port (for service purposes and firmware upgrade), AUX (3.5mm) input, and DC input. All the control buttons are on the top, along the rim. There are 6 nice-looking backlit buttons – Bluetooth, Connect+ button, volume buttons (+ and -), handsfree button (you can use it to answer/end calls, play/pause the music, or activate Siri/Google Now), and power button. Onyx Studio 4 is made of premium materials and you can really fell that by holding the speaker. It’s kind of heavy and it looks quite sturdy. It is completely made of plastic but it’s very thick and very hard plastic. Still, the speaker is not waterproof (it’s not IPX certified) and it’s not shockproof so it’s not the best speaker for outdoor use. It’s more of a desktop speaker. Studio 4 is very much portable since it has a built-in battery and it’s not too heavy to carry around. So, if you want to use it outdoors, you can. But, be warned that it’s not very rugged and that the battery inside the speaker has the capacity of 3,000mAh. The capacity is not bad but it’s not great either, especially when there are 2 woofers and 2 tweeters inside the speaker that need to be driven. Onyx Studio 4 features Bluetooth 4.2 with a 33ft Bluetooth range. You can pair two Bluetooth-enabled devices (phones/tablets/PCs) at the same time with one Onyx Studio 4 (multi-host feature) and the speaker can memorize up to 8 devices. 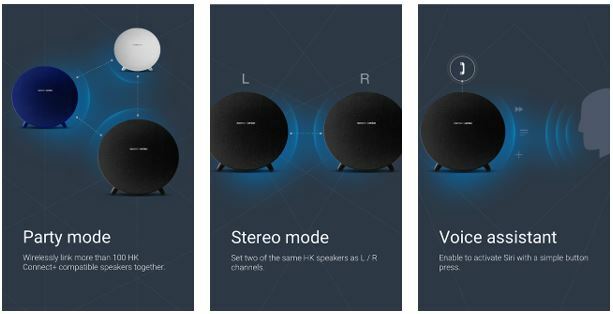 The speaker lacks NFC quick pairing feature so if you are an Android user, you will have to go through the standard pairing process. Studio 4 also has one AUX input so you can connect non-Bluetooth devices to the speaker. The speaker has a built-in microphone (speakerphone feature) with some nice software add-ons (voicelogic + echo/noise canceling). Onyx Studio 4 also features voice-assistant support. You can access Google Now and Siri by long pressing the handsfree/call button. In order to configure/activate this feature, you have to use the HK Connect app which is another nice feature. The speaker can be controlled with this app but most of the users aren’t so happy with this app. We will discuss some app-related issues in the ‘’Performance’’ section. We were mostly happy with this speaker’s performance but there are also some issues that need to be mentioned. We can’t complain about the Bluetooth connection and sound quality (sound quality will be discussed in the next section). The Bluetooth connection works without issues – we haven’t experienced any signal loss or cutout within the advertised range. In fact, if you are using some newer phone (like iPhone X) the range will be even larger (up to 50+ft without obstacles). Pairing is simple and it’s the same for Android and iPhone users (no NFC quick pairing feature for Android users). In order to initiate pairing, you will have to press the Bluetooth button (pairing doesn’t start automatically). Multi-host is also a nice feature and works without issues. Step 1 – Turn on the first speaker, initiate pairing (press the Bluetooth button) and pair it with your phone. You can stream your music to the first speaker now. Step 2 – Turn on the other speaker (don’t press the Bluetooth button). Step 3 – Press the Connect+ button on the first speaker and then press the same button on the other speaker. Step 5 – In order to make them play the music in stereo mode, you will have to download and install the HK Connect App. Step 6 – Open the app and select stereo mode. The speakers should start playing in stereo mode (left and right channels). The app is poorly rated on Google Play and App Store and users don’t really like it. It’s too basic. You can (have to) use it to select the stereo or party mode or to program the handsfree/call button. You can’t play with the sound signature and adjust the EQ settings through the app. The battery is not that small (3,000mAh) but there are four drivers inside (+ passive bass radiator) so the playtime is not really great. Harman Kardon claims that you can get 8 hours of playtime but you can actually get less than 7 at 50% volume (less than 4 hours at 100%). This great sounding speaker needs some larger battery. The built-in mic works flawlessly even if there’s too much noise around you. Kudos to Harman Kardon for that. The sound quality is the most noticeable feature of this speaker. You can hardly get more balanced sound for less than $150. The bass response is impressive for the speaker of this size. The low frequencies are present and punchy even at low volumes (maybe even slightly boosted). Mids are dynamic and all the voices are perfectly clear. Lower mid frequencies don’t get overpowered by the bass until you increase the volume above 80%. The distortion becomes noticeable at 90% volume but it’s not too distracting. The high frequencies are absolutely sparkling. All in all, the sound is balanced and without too much bass boost. The soundstage is surprisingly wide for the speaker of this size. Stereo separation practically doesn’t exist since all the drivers are close to each other but you can get much better separation if you pair two speakers and play the music in stereo mode. Onyx Studio 4 can be loud but it’s not louder than some competitors within the same price range (like UE MEGABOOM or Marshal Kilburn). Owlee Aviary is similar to Onyx Studio 4 but there are some important differences. Aviary is cheaper and it delivers less impressive and quieter sound. If the sound quality is your priority, Studio 4 is a clear winner. They both have speakerphone feature and deliver similar playtime. Aviary features NFC while Studio 4 doesn’t. Owlee Aviary doesn’t support daisy chaining (can’t be paired with another Aviary speaker) while you can pair up to 100 Onyx Studio 4 speakers together. There’s no app for Owlee Aviary while there’s the HK Connect app for Onyx Studio 4. If you need something really cheap that looks similar to Onyx Studio 4, iClever BoostSound might be the best thing for you. You should be aware that iClever BoostSound could never deliver the same sound quality but it’s actually not that bad. iClever looks and feels cheaper (which is not a surprise). The bass is more boosted than on Onyx Studio 4 and. iClever’s playtime is slightly longer (12 hours compared to 7 hours). iClever features micro SD card slot while Studio 4 doesn’t. On the other hand, Studio 4 comes with the app and can be paired with up to 100 Onyx Studio 4 speakers. They both have built-in mics. Omni 10 is another example of Harman Kardon’s recognizable design. Omni 10 is as stylish as Onyx Studio 4 but it’s inferior in all the other aspects. The sound is rich and balanced, the bass is maybe even punchier than on Studio 4 but the overall sound quality of Onyx Studio 4 is better. 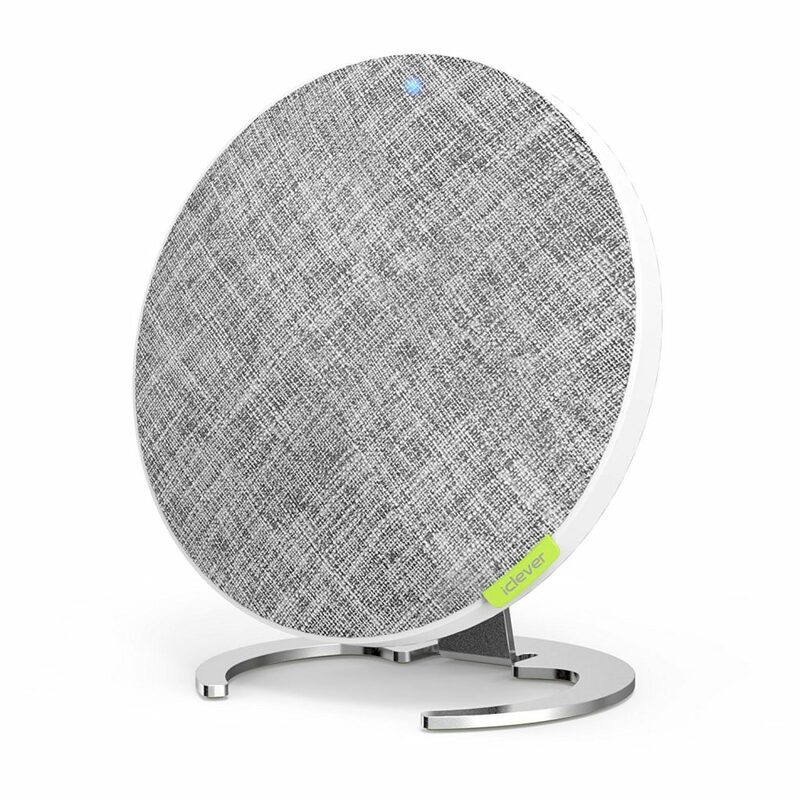 Studio 4 features more powerful battery (longer playtime), it comes with the app, it has a greater Bluetooth range and more stable connection, and it can be paired with up to 100 other Studio 4 speakers. Omni 10 is significantly cheaper. Onyx Studio 4 is, without any doubt, one of the best sounding speakers under $150 and if you don’t care about those drawbacks we’ve talked about (not waterproof, splash proof, shockproof, it lacks NFC, and it needs stronger battery), you should definitely try it. If you want something cheaper but similar to Onyx Studio 4 (at least when it comes to design), you can choose between Owlee Aviary (better option) and iClever BoostSound (worse option). 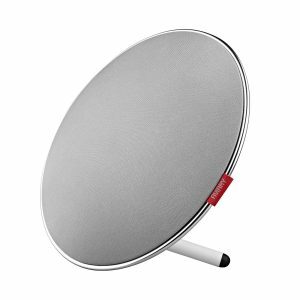 If you want that recognizable Harman Kardon stylish design but you need something cheaper, you can buy HK Omni 10. Still, these speakers are not better than Onyx Studio 4 and if the sound quality and great design are your priorities, Onyx Studio 4 is the best choice. Onyx Studio 4 or JBL Xtreme, what do you think James? Your choice depends on your sound taste and intended purpose. JBL Xtreme and Onyx Studio 4 practically come from the same company (JBL is owned by the Harman International and Harman International is owned by Samsung) and they have a lot in common, especially when it comes to connectivity and advanced Bluetooth features (multipoint pairing, connecting 100+ speakers together for louder sound, etc.). They also have similar apps since they are both developed by the same team (JBL Connect app and HK Connect app). Still, there are some important differences between these two speakers. First, you have the sound. JBL Xtreme delivers stronger (some would say overwhelming) bass, while Onyx Studio 4 delivers more balanced, clearer, and more detailed sound. 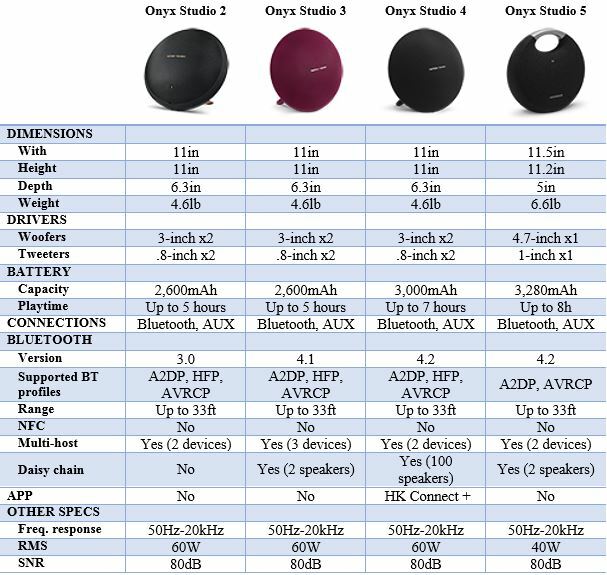 If sound is your main concern, Onyx Studio 4 is a better choice. On the other hand, JBL Xtreme has a much larger battery (10,000mAh VS 3,000mAh) and delivers much longer playtime (15 hours VS 7 hours). JBL Xtreme features 2 Powerbank ports, while Onyx Studio 4 has none. Also, JBL Xtreme is much more rugged and it’s splashproof (IPX4 certified). Onyx Studio 4 doesn’t feature IPX rating. The battery and rugged design make JBL Xtreme more appropriate for outdoor use. Onyx Studio 4 is technically portable but it doesn’t look like something you should be using outdoors.